Physiocratic Economics in Action => Land as the initial source of wealth. Summary of the "Physiocratic" School of Economics, as first proposed by famous French Economist, Francois Quesnay. June 30, 2017 Result. Mkt price of target is 105.26 as I write this at 2:17pm. Network output is another +1, so now three +1's in a row => strong signal to go long. 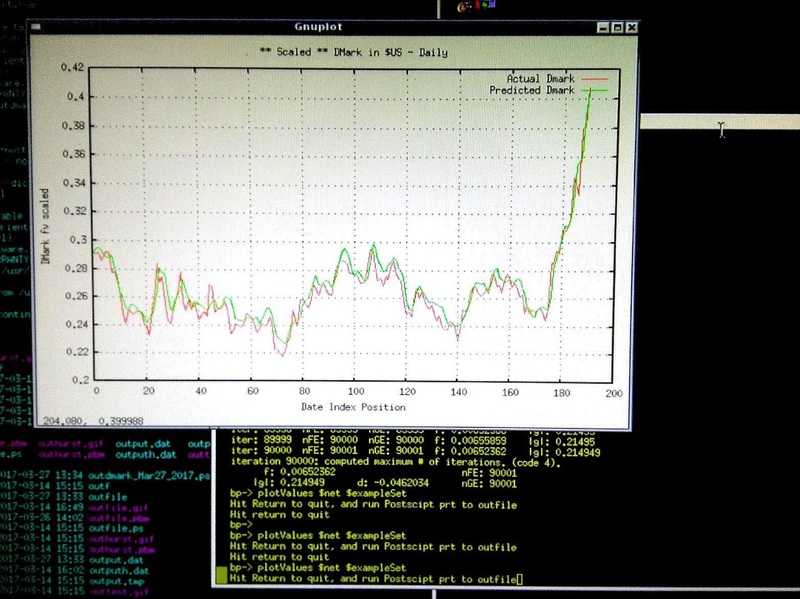 This is an algorithmically generated signal, the output of this simple network, and of course it could be wrong. 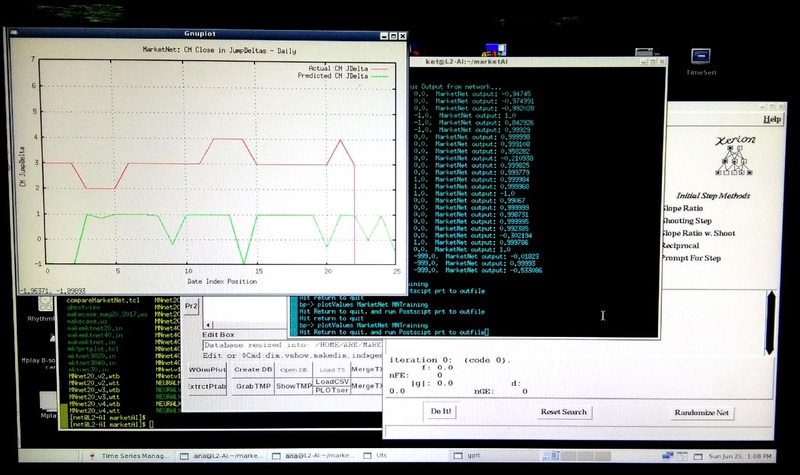 The Hinton Diagram shows the network output as the top white box in "Unit Output" display, -1 is shown as black, and zero is mostly grey. The 40-box row shows the internal network "neurons", which can take on values anywhere between -1 and +1. The actual numeric output is shown on the centre cyan coloured screen, with part of the boolean case table shown to the left. June 25, 2107: Data to June 23, 2017, as of Friday. 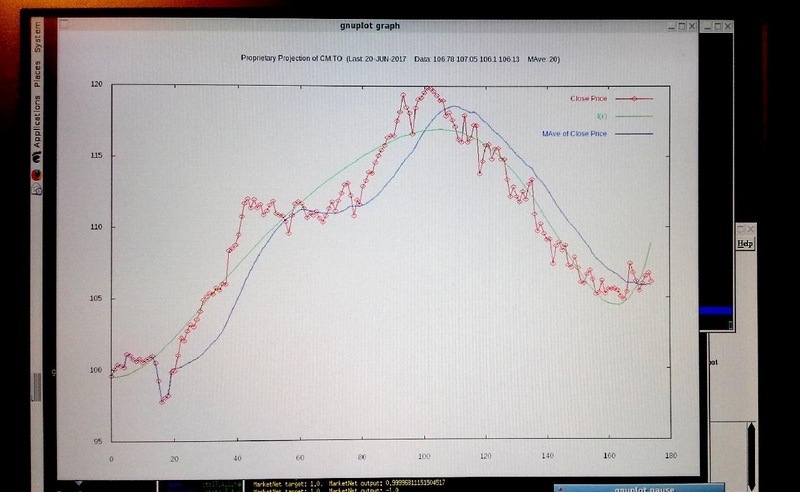 Note that the network has generated a boolean target value of -0.533 which is suggesting (if we round to a boolean -1), a downturn in price of greater than 1% from the June 22nd value, to the value that will prevail as of the close of June 22 + five trading days => June 29, 2017. June 22 close was 107.06. So, June 29, 2017 expected close, is 107.06 - (0.01 *107.06) => 105.99 or lower. What is interesting, is that this forward estimate is only 20 cents off the dividend value, of 1.27/shr, so the NN is providing an expected value that is not unreasonable. And the boolean table does not make a price forecast, it only says it expects the price to be down 1% or more on the target forward day, and only at the close. This is a collection of some of the more interesting economic phenomenon observed recently, and forms a key part of my research work on markets and efforts to develop AI-based Augmenter tools. 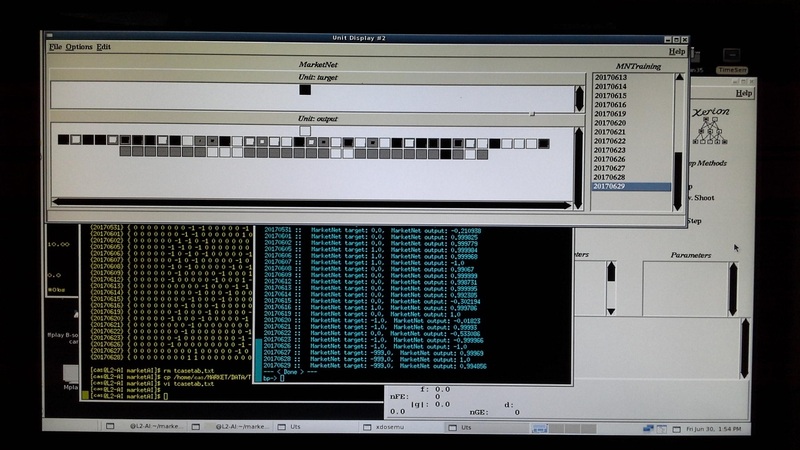 The picture at right, is of the Probability Calculator - here shown running on Samsung Tab-A tablet. It tells you - for a given level of capital, and a chosen level of acceptable risk, how big a bet should be, and what the expected outcome is. Everyone has this type of tool now, and there are few asymetric opportunities for arbitrage. But they do sometimes still come up. 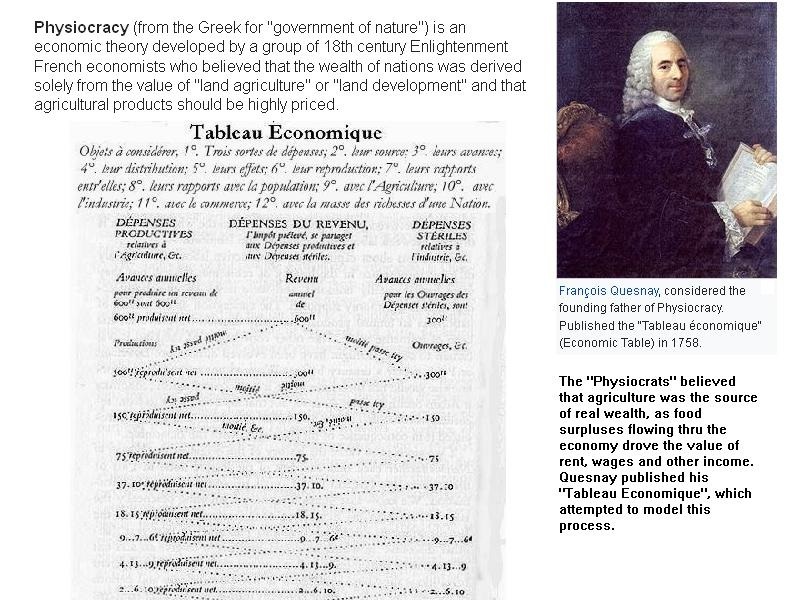 [Sept 21, 2017] - Image montage of Phyisocratic School of Economics, as proposed by Francois Quesnay, in 1770's, suggesting agricultural surpluses are the source of all real economic wealth. This theory was taught to us in school as a discredited and obsolete idea, but in a crowded world, stuffed full of low-cost manufactured items, this theory does not seem quite so quaint anymore. [July 24, 2017] - [ The Risk of a Rapid Onset of Instability - or How to Avoid an Economic Cytokine Storm => Raise Rates 100 bps by Year End. ] Interest rates will have to normalized at some point here in the quite near future. In the Kitchener-Waterloo area, for example, a small urban region in central southern Ontario, near where we are based, the *average* selling price for a residential home has risen over 40% from last year (data for May, 2017). In many cases, the price rises are much more than this. This is solid evidence of a developing asset-bubble, which is being driven by long mortgage rates below 3%. Bank stocks are one of the few asset classes that will benefit from rising rates - and the rates will have to start rising soon, if we are to avoid a runaway bubble-and-burst scenairo, like the Japan situation of the 1980's. The banks themselves here are required to maintain very high levels of capitalization, and they protect themselves with aggressive income verification and property assessment efforts on each mortgage granted, but if you review historical interest rates, long-term mortgages below 3% are unheard of. But that is our situation now. Money is flowing into residential housing, because it cannot find a safe and/or reasonable return anywhere else. 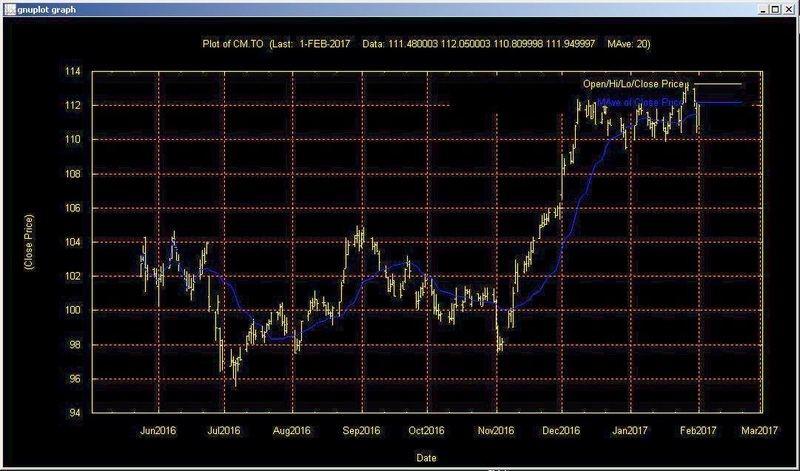 Long Canada's are in the 1% range, and savings products at the banks offer negative yield (when adjusted for inflation). Many folks remain distrustful of equities. (USA had the 2008 Junk-Mortgage Backed Securities crisis, Canada had the Nortel meltdown, which put many people off the stock market forever.) So modest suburban houses are selling for $700K to $800K, nice ones for over $1 million. 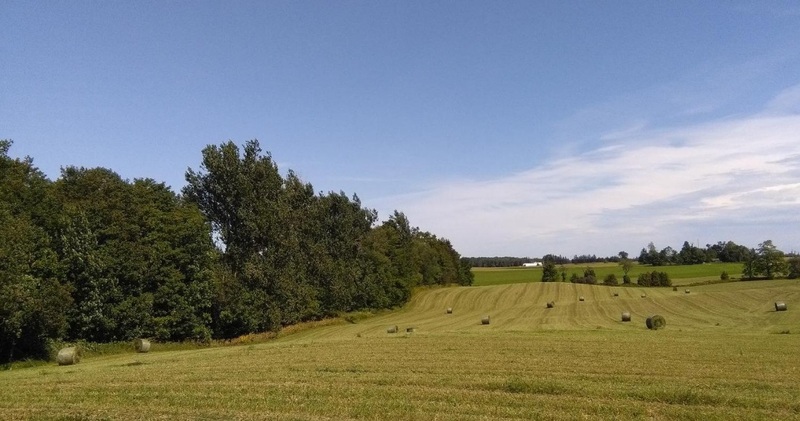 Modest farm and rural properties sell in the multi-millions, and the real-estate agents complain they have no inventory. Short rates need to be upshifted at least 100 basis points by year end, just to maintain economic stability, IMHO. This will goose the Cdn$, and hurt exports, but it will damp down things enough to keep the economic tempest at bay. If oil prices stay low as they are now, this upshift in rates will not hurt too much. What we don't want is to face a scenario where oil goes back to over $100/bbl at the same times as rates need to be raised. I have long maintained that the historical pattern one sees with rate-rises, is that they move *with* stock prices - rates go up, as equity prices rise - with the underlying driver being improvement in the rate of return on capital. And that improvement in the return on capital comes from a mixture of increased educational level and increased productivity of the workforce, improved technology and technical deployments, upgraded economic infrastructure, allowing better communication and transportation of production, and better capital *mobility* - investment money can find and move towards opportunities where it gets the best results. These improvements often seem to show up as rising returns - so that both interest rates and stock prices move higher. And I had a glass of beer at a bar very recently, and it cost $7.00. And should I decide I need to buy a *new* pickup truck - I just looked at the dealer where I bought the one I have now - and the new ones are *over* $70,000! You may own your property mortgage-free, but be prepared to take out a mortgage to buy your new truck! We are already seeing the clear beginnings of a developing runaway-inflation. It is only by fiddling the raw price data by making "hedonic adjustments" that the government statistical agencies can maintain the illusion that we are not already experiencing dangerous levels of inflation. And of course, prices are moving higher faster than salaries and wages. There is a plan to raise the minimum wage to $15/hr, but all that will do is hurt employment opportunities for young, entry-level kids trying to get their first real jobs. I have direct experience with the economic collapse of the mid-1970's, as I did detailed research on price levels at that time. We had had the "oil shock", and watched in horror as the Americans tried to control gas prices by legal fiat. (Gas stations had no gas - long lineups were everywhere as fuel retailers and mid-stream oil companies were asked to sell below cost. Comically stupid, but also tragic. In Canada, Trudeau (Ver. 1.0) created the Anti-Inflation Board, and brought in wage and prices controls, after promising in the election campaign that there would *not* be a wage-and-price control program (he lied.) Also comically stupid, and also tragic. But the key learning experience for me - which I pass along here - is that inflation is *really* bad - and it cannot be ended by legal foolishness and government programs. The awful inflation of the 1970's was ended in 1980, by jacking the short and long interest rates up to +20% - and that was the official rates for things like gov't bonds! It was *very* harsh - yet very effective and necessary - medicine, and it killed a lot of businesses. But it also solved the problem, and the 1980's were a boomtime for everyone, everywhere, as the value of money could be trusted again - at least for a while. We now have the flip side - near-zero rates, and yet, no runaway inflation. Yet. But when it begins, it may manifest differently than the oil-shock of the 1970's. We have never had a complete loss-of-confidence in paper money - at least not since France in the 1700's - (the John Law experiment with the first paper currency), but that remains a possible outcome. Unwise people mock Bitcoin and other distributed-ledger virtual non-state currency. But look at how "virtual" our money and our assets are now. Does anyone anywhere actually hold physical share-certificates anymore? 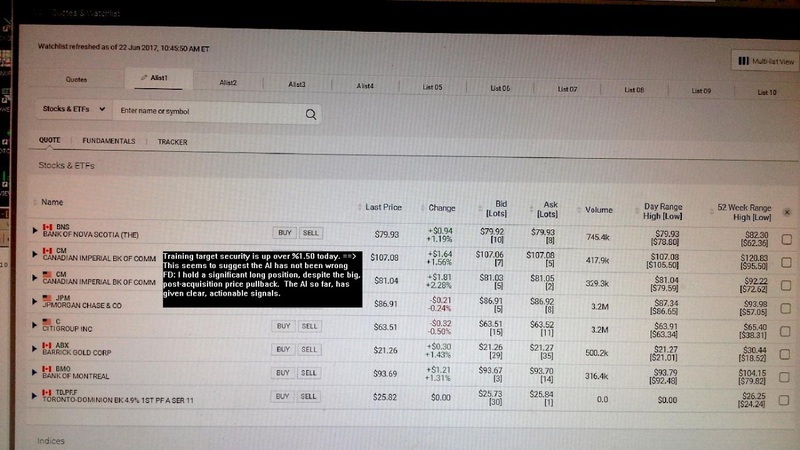 Are those shares really in your portfolio? I can access the bank's website, and they used to send me paper statements (but now I get .pdf files instead). The shares are just digits in datafiles. Bernie Madoff sent out paper statements to his "clients" (victims), but they were lies. I trust my bank (and my bank stocks). And private American business seems honourable, and the New York Stock Exchange has the best and biggest and probably most fair securities market in the world. But the various governments in the USA are another matter. They always seem to be seizing private assets for one reason or another (the Wall Street Journal would publish page after page of the cash taken from people at US border crossing and in police raids. Apparently, in the USA, just having a lot of cash is somehow sufficient proof that you are "money laundering" or some such nonsense.) So, your money is almost always neither physical, nor safe, nor even really protected by law anymore. And it is certainly not backed by gold or silver or any physical thing like that. In the United States, the government can take anyone's wealth by just passing a law. So when I look at history, and study how easy it is for things to get really bad, really quickly, I remain concerned that a non-linear reactive response to modern American law that seems to characterize that place, might occur and affect us here on this side of the border. But we are joined at the hip to these people, and thus must accept these risk factors like it or not. If one studies how easily, and almost accidentally, the entire European nation-group (and then us, of course as well), basically fell-into the First World War, it is very curious and disturbing. A minor terrorist incident was escalated quickly into a big mass mobilization. The mobilization was viewed with fear and loathing, and reactive mobilizations quickly occurred in other countries. Once everyone had mobilized, that path to war was complete. Do you build a road, and then not use it? Patriotic drumming and tub-thumping began, and happy, healthy young men rushed to join up, to be part of an adventure that was expected to last only a couple of months. Those that did not become corpses, often returned maimed and broken. The resulting carnage was on a scale that is difficult to imagine. And when the entire absurd, insane, pointless, stupid slaughter was ended in 1918, the returning soldiers took a horrific virulent influenza strain home with them, that by modern estimates killed between 50 and 100 million people worldwide. The so-called "Spanish Flu" of 1918 was more deadly than the war. I did a small study recently on the lethality and other features of the 1918 flu pandemic, and I believe it was seriously under-reported - basically because the data-gathering tools just didn't exist in many parts of North America, and were non-existant in several other nations. The illness came on so quickly, and was so lethal, that many who died were not officially counted. One specific example: Four people were playing cards. One said she did not feel well, coughed a bit, and lay down. By morning, all 4 were dead. In Canada, there were whole villages where everyone died. In the same way that the Securities Laws and Federal Reserve were developed in response to the 1929 stock market crash, public health measures and proper data collection on citizen health, seems to have been developed in response to the 1918 Flu Pandemic. One thing that appears to have made the 1918 flu so lethal, was that it hit *healthy* people hardest, and came on very fast, as it is thought to have provoked what is now termed a "cytokine" storm, or a massive, intense immune system response, which causes one's lungs to fill up with fluid very quickly, so that you basically choke to death on your own pneumonic response to the pathogen. My whole thesis here, is that weirdly awful, non-linear negative responses appear to be not just not-uncommon - but actually seem to be how things play out, if there has been a previously long period of stability. We need to look at history, and see this a bit more clearly. The longer we remain in this weird-zone of low rates + fiat money-pumping, the greater is the likelyhood that significant destabilization could occur. And it might happen at "internet speed", I suspect. And if you couple this unhealthy zero-rate-of-return-on-capital world, with the abuse of our traditional legal protections (the actions of the US CIA and the NSA provide good examples of what I am talking about) and the ongoing militarization of both the Middle East and the Far East, it seems as if we are tee-ing up a reactive response that no one really wants at all. While North Korea tests nuclear weapons, and launches multi-stage ballistic missles at Japan, the left-leaning Americans attempt to bring down their President for talking with the Russians during his election campaign. To me, this shows a degree of outright insanity in the US political process. (I *want* the US President to have a good working relationship with President Putin of Russia. Why is their dialogue even an issue?) This curious level of dysfunction in America at this point in time also provides motivation for a rapid loss-of-stability scenario. If America and Russia launch rockets and bombs at each other, they fly over my land. No one benefits from that kind of conflict. No one. We need to re-examine the "stabilization policies" of the 1960's and 1970's, and recognize the virtue and necessity of our governments taking counter-cyclic actions to enhance the prospects for trans-national economic and social stability. I am not arguing that we should hit the brakes - just maybe ease up a bit on the gas before we have to take the next curve on this rain-slicked highway-to-hell that we are accelerating along on as we grimly rush towards our futures. We have our white-knuckled hands gripped tightly to the wheel, our teeth-gritted firmly together, our eyes a little bleary from lack of sleep. The radio is turned up too loud, and the window is open, so the cold air keeps us awake. Are we there yet? Has this been enough *stimulation*? Or do we have to keep printing more money to give to rich people in New York, to keep the US economy humming? How much longer will the citizens of this planet actually tolerate this America? Another 50 years? Or maybe only another 5? Or maybe it happens next week? Will it be North Korea that launches first? Or maybe North Carolina? I am unable to see much in the near future, but curiously, it is that timeframe that concerns me the most, for there seems to lie the greatest uncertainly, and the most risk. [June 25, 2017] - The Xerion-based Neural-Network experiment, using the boolean jump-delta table is producing interesting results. The approach looks as if it might be useful. The information it provides is clear and actionable. Of course, one needs a lot more data to say anything with any legitimate scientific validity at this point. I will need to evaluate the results in conjunction with a methodology for interpretation, that can be tested against various runs of randomness. I will need to see the network produce consistantly better-than-random results, before I can assert that it is providing value. And of course, the human world is also changing, so I may find that I am trying to hit a moving target, perhaps unsuccessfully. The NN-AI results, provided by the boolean-table driven neural-network, have to be looked upon with suspicion. The AI might just be getting lucky. If you were using the NN-AI as the "old, wise fellow" it is conceptually designed to be, you would have sold your position in the target-security on Friday, somewhere in the upper 107 level (say, 107.70). Mkt close of 107.38 on June 23rd (Friday), means that this strategy looks already to have been successful, as the target will open near 106.11 on Monday morning, all else being equal. My objective now is to produce an evaluation methodology that lets me assess both NN-AI effectiveness, and expected profitability. The idea is to see if there really is an *edge* being created here, or am I just curve-fitting randomness. We will try not to be fooled here. June 22, 2017: Summary of the current state of NN-AI output. The on-screen text is beside the most recent boolean output. The TSM (Time Series Manager) screen provides historical price quotes which are being used to make boolean table which NN-AI is using. This is today's action, June 22, 2017, (as of earlier this morning.). Target securty is now up almost 2 (up 1.89% in Cdn$ terms, and 2.41% in US$ terms. The postive results from the AI (and the desire to get my dividend! ), kept me in my position. Like it or not, the researcher is *always* part of the experiment. This is an older, curve-fitting model. It is interesting, but the NN-AI is better technology, I suspect. This is the Long-Wave picture. This particular business has been in operation a long time, and paid it's dividend throughout the Great Depression of the 1930's. The so-called 2008 "Great Recession" was a trivial burp, compared with what the 1930's looked like. But even the 2008 "burp", took our target's price down 60%. Equities - and life - are risky business. But if the process is good, and one stays focused, and does act unwisely, good decisions are usually rewarded. (Older results... before NN-AI developed... ) Chart of example raw price-data series, with 20-day simple moving average, showing breakout and run up to a "resistance" level. Neural Network output chart (Actual & Predicted) for old D-Mark data (late 1990's), after 90,000 interations, using steepest descent, fixed step search. Basically, just curve-fitting the time-series. Not really very useful, but shows success of the Xerion backpropagation algorithm running on the Linux platform. 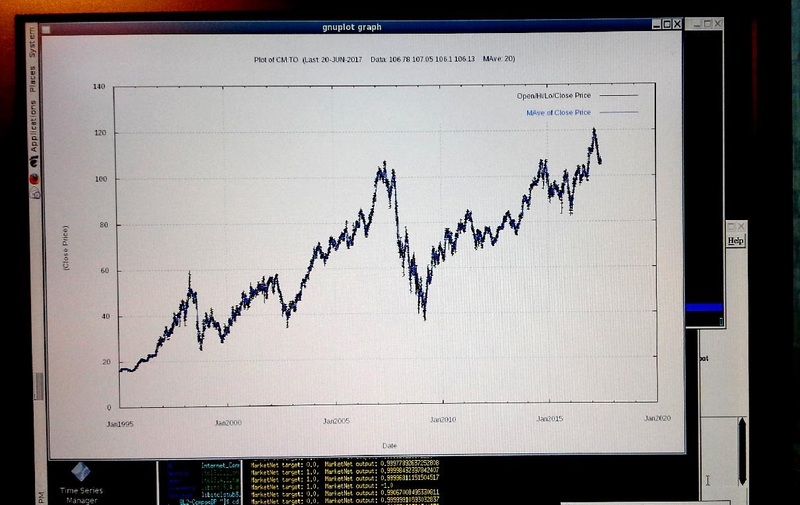 Chart produced in GNUplot, viewed via Ghostscript. This is just a chart of today's action in the Cdn-Dollar. 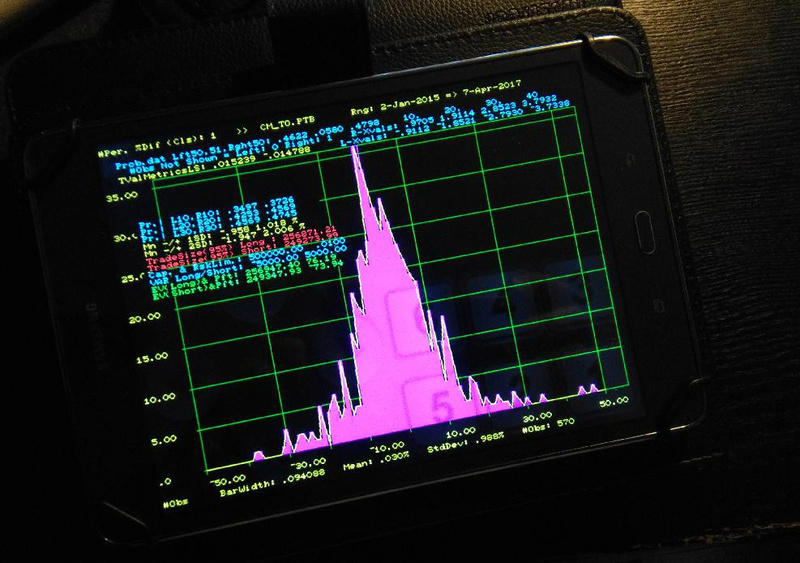 It's like the output of a square-wave generator - zero rise-time, a bit of noise on the top flatline, and then back to where it started, 100% mean-reversion. Floor-traders on the old (and very sophisticated) commodity exchanges many years ago, would call this "Shake Da Money Tree! ", or sometimes "a gun-run", (from "gunning for stops"). where the market would zoom in one direction, take out all the stop-loss orders, and then zoom right back to where it started from. This is not a random process or phenomenon. Long-waves of Gold Prices in $US, April 1, 1968 to June 9, 2017. This picture is as much about US economic policy, as it is about the valuation of a physical commodity. Reminds me of a Cheryl Crow song, "Run Baby, Run..". 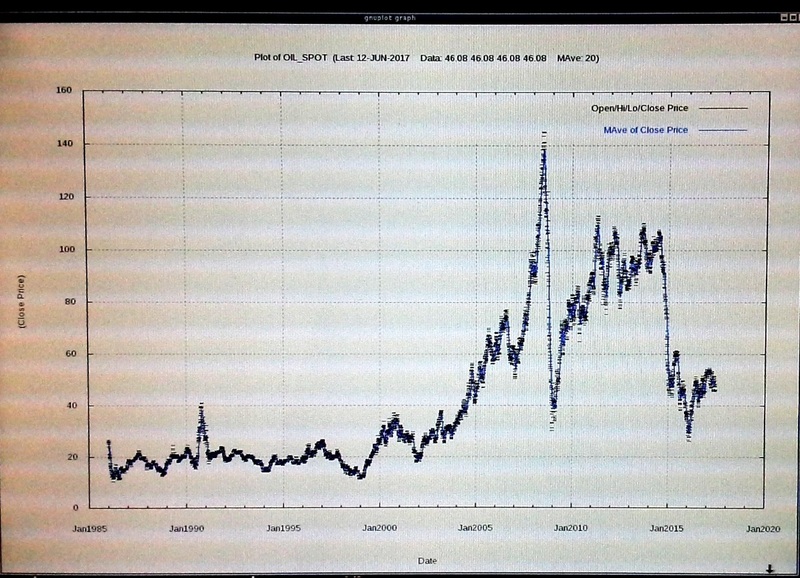 If you look at long-wave of oil-prices, it gets even more wild. 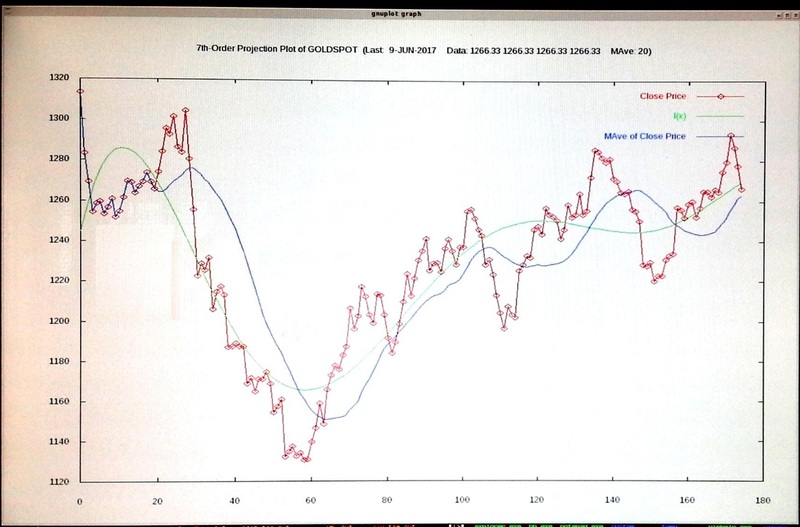 Here is same Gold Price series (US $), for last 175 days, (to June 9, 2017), with a 7th-order non-linear least-squares curve fit. If you look at enough of these price charts, you end up becoming an "Elliott Wave" aficionado. But the key thing about gold, is that "Gold ist gold" - as the world changes, gold does not. It simply remains as gold. The Chief Economist of the Bank of Montreal was recently quoted as pointing out that as measured in ounces of gold, the prices of houses in Toronto (Canada's largest city), although high in Canadian-dollar terms, are in fact *lower* than they were at their peak, in 2005, when priced in ounces of gold. Douglas Porter's May 26th note indicates that in 2005, the average house price in Toronto was 655 oz. of gold. In May of 2017, this was down to 540 oz. of gold. 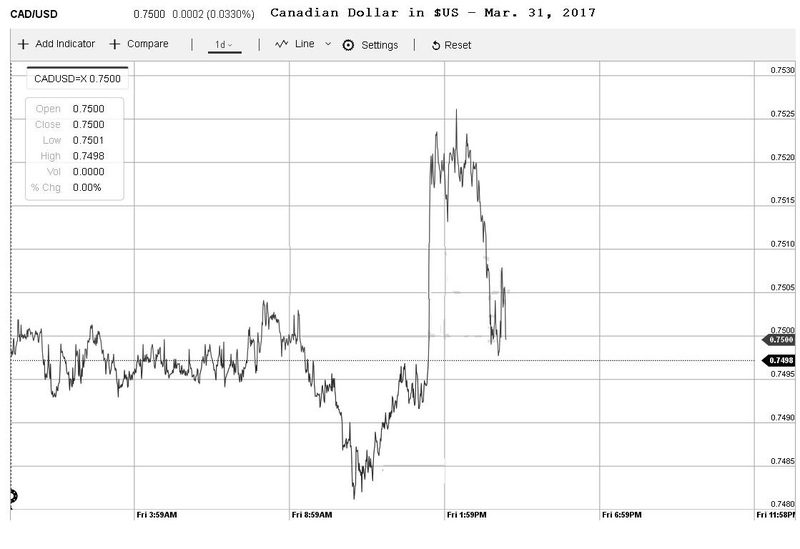 What of course has happened, is the value of the Canadian dollar has shifted down sharply, because of policy actions on the part of the Canadian Government and the Bank of Canada. They elected to substantially deprecate the value of the currency. Devaluing currency to boost economic activity is a very old (and effective) economic strategy, but it always results in a wave of inflation, which first shows up as rising asset prices. Of course, markets often move counter to the known trends, as wise players play the other player, rather than just the economic trend that all players know will ultimately play out over time.